Taiwanese earth sea satellite. Taiwan's ROCSAT (Republic of China Satellites) were built for Taiwan's National Space Program Office. Earth Observing satellite built by TRW for NSPO, Taiwan. Launched 1999. Used the T200A bus. AKA: Theos. Status: Operational 1999. First Launch: 1999-01-27. Last Launch: 2008-10-01. Number: 3 . Gross mass: 400 kg (880 lb). The test satellite series progressed from all-American to all-indigenous satellite components. Taiwan's first satellite, ROCSAT (Republic of China Satellite) was built by TRW for Taiwan's National Space Program Office. 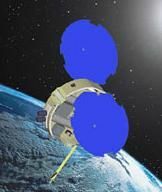 ROCSAT carried a Ka-band experimental communications payload, an ocean color imager experiment to study plankton distribution for fisheries management, and an instrument to measure thermal plasma in the equatorial ionosphere. It was equipped with a small hydrazine orbital adjustment engine. 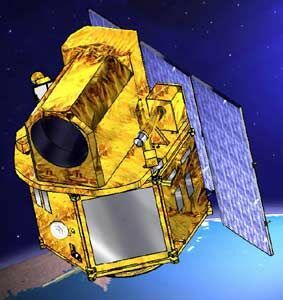 ROCSAT-2, scheduled for 2003, was to observe and monitor the terrestrial and marine environment and natural resources throughout Taiwan, its remote islands and surrounding ocean. It would also carry a sprite imager to study electrodynamic coupling between thunderclouds and the upper atmosphere. Taiwan contracted for launch of ROCSAT-2 on an American Taurus booster. 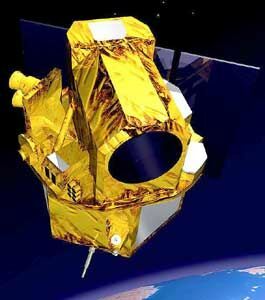 On 4 May 2001 Taiwan and the United States on Thursday signed an agreement to produce and launch by the end of 2005 six ROCSAT-3 micro satellites for weather forecasting. Taiwan companies were to be awarded contracts for the major components. ROCSAT-3 was part of Taiwan's 15-year space program launched in October 1991 at an estimated cost of $ 413 million. Family: Earth, Earth seasat, Medium earth orbit, Surveillance. Country: Taiwan. Spacecraft: Athena Mars Flyby. Launch Vehicles: R-36M 15A14, Taurus, Athena-1, Dnepr, Taurus 3210, Taurus 3110. Launch Sites: Cape Canaveral, Vandenberg, Vandenberg 576E, Cape Canaveral LC46, Dombarovskiy. Agency: TRW, NSPO. Bibliography: 2, 4, 13024, 13025, 13026. 1999 January 27 - . 00:34 GMT - . Launch Site: Cape Canaveral. Launch Complex: Cape Canaveral LC46. Launch Pad: SLC46. LV Family: Athena. Launch Vehicle: Athena-1. ROCSAT-1 - . Mass: 400 kg (880 lb). Nation: Taiwan. Agency: NSPO. Manufacturer: TRW. Class: Earth. Type: Seismology satellite. Spacecraft Bus: T200. Spacecraft: ROCSAT. USAF Sat Cat: 25616 . COSPAR: 1999-002A. Apogee: 523 km (324 mi). Perigee: 479 km (297 mi). Inclination: 34.96 deg. Period: 94.63 min. Taiwan's first satellite, with experimental communications, ocean imagery, and ionospheric studies instruments. The Primex OAM placed itself and the payload into an elliptical transfer orbit. A second OAM burn circularized the orbit, and ROCSAT separated into a 588 x 601 km x 35.0 deg orbit. 2004 May 20 - . 17:47 GMT - . Launch Site: Vandenberg. Launch Complex: Vandenberg 576E. LV Family: Taurus. Launch Vehicle: Taurus 3210. ROCSAT 2 - . Payload: LeoStar 500XO. Mass: 760 kg (1,670 lb). Nation: Taiwan. Agency: NSPO. Manufacturer: EADS Astrium. Class: Surveillance. Type: Civilian surveillance satellite. Spacecraft Bus: T200. Spacecraft: ROCSAT. USAF Sat Cat: 28254 . COSPAR: 2004-018A. Apogee: 891 km (553 mi). Perigee: 887 km (551 mi). Inclination: 99.10 deg. Period: 102.80 min. Delayed from October, November 25, 2003; January 17, February 26, April 9 and 22, May 17, 2004..
2008 October 1 - . Launch Site: Dombarovskiy. LV Family: R-36M. Launch Vehicle: Dnepr. Theos - . Mass: 715 kg (1,576 lb). Nation: Thailand. Agency: Makeyev bureau. Manufacturer: EADS Astrium. Class: Surveillance. Type: Civilian surveillance satellite. Spacecraft Bus: T200. Spacecraft: ROCSAT. USAF Sat Cat: 33396 . COSPAR: 2008-049A. Apogee: 693 km (430 mi). Perigee: 673 km (418 mi). Inclination: 98.80 deg. Period: 98.40 min. Thai surveillance satellite, based on EADS Astrium bus used for ROCSAT-2..